KING OF PRUSSIA, Pennsylvania — Republican presidential nominee Donald Trump and his running mate, Indiana Gov. Mike Pence, made one of their last joint appearances before Election Day near the site of George Washington’s historic winter encampment on Tuesday. Their focus: repealing and replacing Obamacare. Pence took the lead, with Trump deferring to his running mate’s extensive experience in innovation in health care policy. In January 2015, Gov. Pence launched the Healthy Indiana Plan, or HIP 2.0. The plan is a modified version of the Medicaid expansion that many other conservative governors, such as Wisconsin Gov. Scott Walker, have rejected (and which some had promised to reject, but later accepted). It expands Medicaid to those living within 138% of the poverty level, but also requires them to make contributions to their own health insurance, on a sliding income-based scale. Pence had to negotiate with President Barack Obama to receive approval for his modifications, and faced criticism from conservatives for accepting any part of Obamacare. But he defended his decision in an op-ed in the Indianapolis Star in January: “Obamacare did not create the Healthy Indiana Plan. HIP existed before Obamacare, and it will exist after Obamacare.” He said Obamacare’s repeal would require a transition period, but the program would survive. The contributions are made to a health savings account called a Personal Wellness and Responsibility (POWER) account, building on a program started by Pence’s predecessor, Mitch Daniels. And the policy has largely been a success. Earlier this year, Gov. Pence announced that HIP 2.0 patients had reduced emergency room visits by 40% and that 70 percent of participants were paying into their POWER accounts. On Tuesday, Pence touted that experience. “Americans are putting their personal health second because Obamacare’s skyrocketing costs are too expensive and too burdensome,” Pence warned. “I guess even with a Clinton, sometimes truth happens,” Pence quipped, to applause. In a Trump presidency, he said, “we’re going to repeal Obamacare — lock, stock, and barrel.” He then went on to explain what would replace it, using the free market — and without growing the government. protecting coverage for those with pre-existing conditions. Pence noted that HSAs were pioneered in Indiana, and that the Trump plan would provide support directly to individuals using HSAs, rather than to insurance companies from whom individuals were forced to buy insurance under the current system. He called Medicaid “broken,” noting that “Obamacare has put a majority of the people receiving new coverage into a broken system.” And he touted the reforms he had made under HIP 2.0 as an example of how states can innovate. 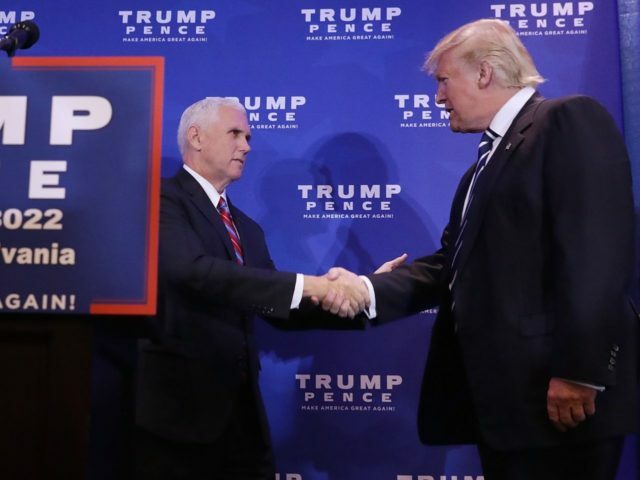 Pence introduced Donald Trump, who was greeted with familiar enthusiasm by the audience. Trump pledged to ask Congress to convene a special session to repeal and replace Obamacare, warning that premiums in Pennsylvania would increase more than 60%. He warned that health care costs were overwhelming families’ ability to pay their bills, and even their mortgages. He warned that millennials and young people would face an “unfair” situation due to Obamacare, where they “will be totally crushed by these massive health care costs before they even get started on their journey through life.” And he noted that local residents only had one insurance provider from which to choose, in one-third of Pennsylvania counties including Philadelphia. “Hillary Clinton wants to expand Obamacare and make it even more expensive. She wants to put the government totally in charge of health care in America,” he said. As Pence did, Trump outlined the basic elements of his replacement plan. “Our replacement plan includes Health Savings Accounts, a nationwide insurance market where you can purchase across state lines, and letting states manage Medicaid dollars. So much better. 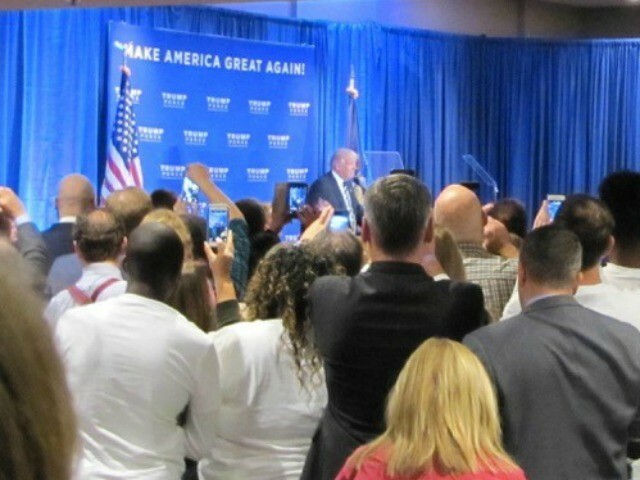 Trump also hit points from his stump speech, talking about bringing manufacturing jobs back to Pennsylvania, increasing military spending, ending Common Core, expanding school choice, and other priorities. Pence was introduced by Dr. Ben Carson, who was one of Trump’s rivals in the primary, and later endorsed him. “We’re going to bring the power back to the people and to the health providers,” he said of Trump’s plans to replace Obamacare. 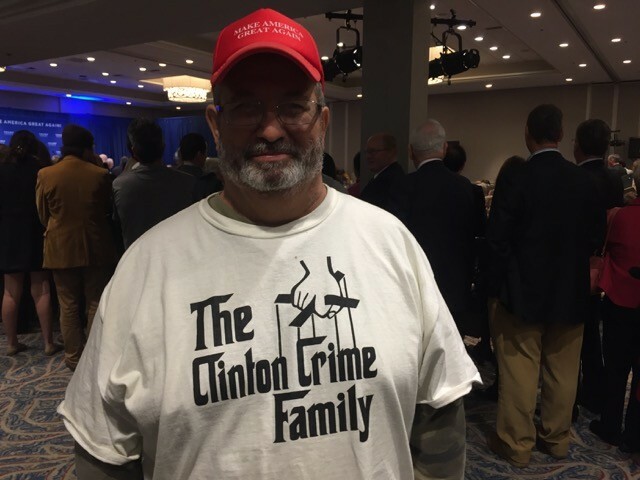 Local Pennsylvania resident Ray Ballone was asked if, as some have suggested, a Hillary Clinton administration would be wrought with scandal and investigations.“Four years of that — scandals,” he told Breitbart News. Ballone said that he had been a supporter of Dr. Ben Carson for president, but now supports Trump. 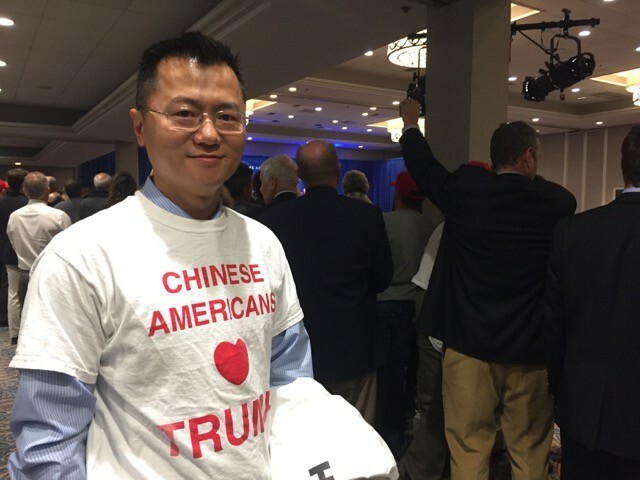 Another Trump supporter, Nick Xu, told Breitbart News that he is a legal Chinese immigrant to the United States and has been volunteering for two months on the Trump campaign. He said that he is a naturalized U.S. citizen. Sen. John Barasso (R-WY) had kicked off the event. He reminded the audience that Pennsylvania is facing steep double-digit increases in health insurance premiums under Obamacare next year. And, he added, “What does Hillary Clinton say about this? More obamacare. What does Bill Clinton say about this? ‘Craziest thing I ever saw!’,” to laughter and applause. Rep. Tom Price (R-GA), who is also a physician, led a group of House members onstage, many of whom have medical degrees or expertise. Rep. Michael Burgess (R-TX) said: “Many of us watched in horror in 2009 and 20010 as no Republicans were consulted and this thing was rammed through,” noting that then-White House chief of staff Rahm Emanuel exploited one crisis, only to create another. Rep. Renee Elmers (R-NC), who noted the strong presence of women in the room, mocked President Barack Obama’s comparison of Obamacare to a first home: “If it’s a house, it’s an outhouse,” she said, to laughter. I would like to thank my incredible running mate, Governor Mike Pence, who has been a tremendous leader on health care issues. Let me also thank Dr. Ben Carson, not only a great man – but one of the toughest competitors I’ve ever faced. People do not know how well he did during the primaries, but even more importantly, he is a brilliant physician, and I hope he will be very much involved with my Administration. I’d also like to recognize the distinguished Members of Congress in attendance, who have all been at the forefront of health care reform. Congresswomen Ellmers and Lummis, and Congressmen Price, Harris, Burgess, Desjarlais. And let me give a special thanks to Senator Barrasso, a terrific doctor, and a Senate leader, who did incredible work chairing our platform committee. When we win on November 8th, and elect a Republican Congress, we will be able to immediately repeal and replace Obamacare. I will ask Congress to convene a special session. Obamacare is a catastrophe. The President said if you like your plan you can keep your plan, if you like your doctor you can keep your doctor – which may go down as one of the great political lies of the century. Even the skeptical Democrats believed him and approved the legislation. No one even read the 2,700-page bill. The Obama Administration has just announced massive double-digit and triple-digit Obamacare premium hikes everywhere in the country. Here, in Pennsylvania, premiums are going to increase more than 60 percent. That means parents won't have enough money to pay their bills, or get medicine for their kids. In the great state of Arizona, a wonderful place I just left, premiums will go up even higher than 116 percent – others states are going up more than 60, 70, 80, and 90 percent. Deductibles can go to 12 thousand, 13 thousand, 14 thousand and even 15 thousand dollars. These deductibles are so high that your health care won't even be usable. People all across the country are devastated. In many instances, their health care costs are more than their mortgage costs or rent, a first in American history. This is particularly unfair to millennials, and younger Americans generally, who will be totally crushed by these massive health care costs before they even get started on their journey through life. One-third of the counties in Pennsylvania will have only a single insurance company. That includes Philadelphia. Insurers are leaving, premiums are soaring, doctors are quitting, companies are fleeing, and deductibles are through the roof. Workers’ hours are being cut, hiring is frozen, and wages are being slashed. Obamacare means higher prices, fewer choices, and lower quality. Yet, Hillary Clinton wants to expand Obamacare and make it even more expensive. She wants to put the government totally in charge of health care in America. If we don’t repeal and replace Obamacare, we will destroy American health care forever – it’s one of the single most important reasons why we must win on November 8th. Our replacement plan includes Health Savings Accounts, a nationwide insurance market where you can purchase across state lines, and letting states manage Medicaid dollars. We will create quality, reliable, affordable health care in a free market where parents can make the health care decisions that are right for their families. It will be much better health care, at a much less expensive cost. We’ve also outlined detailed solutions on so many other issues to make life better for every American family. That includes a plan to bring back the manufacturing jobs that form the backbone of the American Middle Class, and our country as a whole. Pennsylvania has lost almost 40% of its manufacturing jobs since NAFTA – a deal signed by Bill Clinton and supported by Hillary Clinton. The City of Philadelphia has lost more than 1 in 3 of its manufacturing jobs since China joined the World Trade Organization – another Bill and Hillary-backed deal. A Trump Administration will renegotiate NAFTA, and stand up to foreign product dumping, currency manipulation and unfair subsidy behavior. We are going to bring manufacturing and jobs, lots of jobs, back to Pennsylvania. We are going to open modern mines, and take care of our great miners. We will be producing clean coal, oil, natural gas and shale energy. We’re also bringing back our steelworkers, whose jobs have been stolen by the dumping of steel all over this state and country by China, and other countries. Nobody has been treated worse than these workers, but that will change on January 20th of next year. We are also going to provide the children of this state with school choice. That means parents can send their kids to the public, private, charter, magnet, religious or home school that is right for them. We will totally eliminate Common Core and bring education local. Our tax plan will provide a 35% tax cut to Middle Class families with two kids. We will let parents deduct childcare expenses from their taxes, and create tax-free Childcare and Eldercare Savings Accounts – with matching contributions for low-income families. We will eliminate the Obama-Clinton defense sequester and rebuild our badly depleted military. Our Navy is the smallest it has been since World War I, and rebuilding it will require a truly national effort. That is why I will ask my Secretary of the Navy to review facilities like the Philadelphia Navy Yard with a long history of service to our Navy, proximity to vibrant private industry, and room for expansion to enlist them in rebuilding our Fleet. To recruit the master craftsmen this buildup requires, we will establish "centers of excellence" at locations like the Philadelphia Navy Yard. We will rebuild our military and we will rebuild this country. I am not a politician. My only special interest is you, the American People. The guiding rule of the Political Class in Washington, D.C. is that they are looking out only for themselves. They will say anything, and do anything, to cling to their power and prestige at your expense. I’m running to change and reverse decades of failure, and to work with the American people to create generations of success. I’m running to restore honesty to our government, safety to our communities, and prosperity to our economy. I want to go into our poorest communities and work on a national plan for revitalization. Americans are tired of being told to defer their dreams to another day – but politicians really mean another decade. Enough waiting. The time is now. But to accomplish our goals, we must cut our ties with the small, bitter and petty politics of the past. We must declare our independence from a failed establishment that has squandered $6 trillion on foreign wars in the Middle East that never end and that we never win and that have made us less safe. They’ve left our borders wide open at home, and shipped our jobs and wealth to other countries. It is time for a new leadership. I’ve led a great life – and I truly love our country. So now, I want to give back to the country that has been so good to me. All I see, everywhere I travel in this nation, is untapped potential waiting to be realized. If we unlock the potential of this country and its incredible people, no dream is outside of our reach. If we stop believing in our failed politicians, and start believing in ourselves, then anything is possible. I’m asking you to Dream Big, to push for Bold Change, and to believe in a movement powered by our love for each other and our love for our country. That is how we will truly make America Great Again.